With stunning ocean views, spacious fields and a friendly relaxed atmosphere, Bryher Campsite is the perfect base for exploring the Isles of Scilly. Enjoy the freedom of bringing your own tent for traditional camping, or the total relaxation of a fully-equipped rental Bell Tent. The site is nestled between two hills, moments from a white sand beach on the tiny island of Bryher - the smallest inhabited island in the Scillonian archipelago, 28 miles off the Cornish coast. Choose your own pitch to enjoy panoramic views of the Atlantic to the west, or gaze across Tresco Channel with its fishing boats and Cromwell's Castle to the east. There's a reason The Telegraph has chosen us as their top coastal campsite! Bryher is the smallest of the Isles of Scilly, and an island of contrasts with beautiful, safe sandy beaches on one side and dramatic cliffs on the other. With plenty of things to do and places to eat Bryher is the perfect base for a relaxing but fun island escape. The rest of the Isles of Scilly are just a short boat journey away, and with boats to the other islands of Tresco, St Mary's, St Martin's and St Agnes throughout the week, you can explore the whole of Scilly from your base right here on Bryher. Getting to Bryher is as easy - you can fly or sail to Scilly from the mainland and then hop on the small inter-island ferry to Bryher. Getting your luggage here is simple too: we take care of everything and we'll even drop your bags straight to your pitch. We're here to help, so please get in touch if you have any questions. We look forward to seeing you on the Isles of Scilly - and Bryher Campsite - soon! 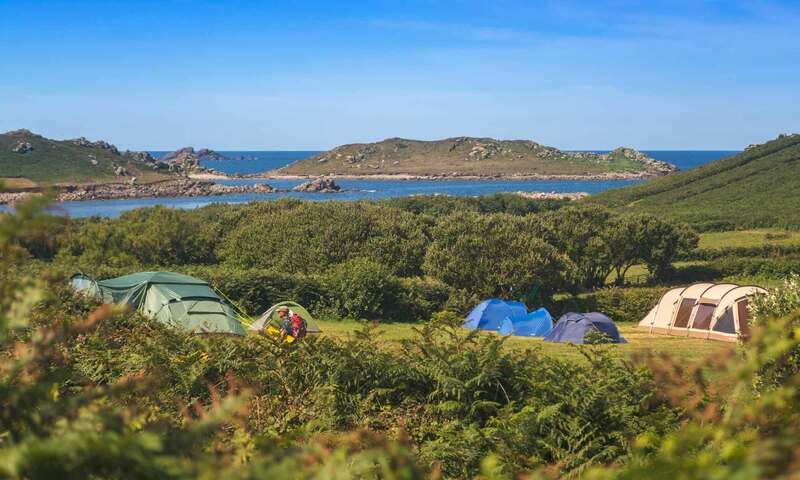 Bryher Campsite enjoys lovely salty views of Hangman's Island and Tresco. Bryher can feel like an other-worldly paradise, with glorious sandy beaches and quiet coves for swimming. Nestled in a sheltered valley on the breath-taking island of Bryher. It’s tents only at this discreet site that blends effortlessly into the landscape of the island. It’s undoubtedly a beautiful spot. A green field divided up by low dry-stone walls, with beautiful views of crumbling castles, white sand beaches and the ocean. If you go in May or June you may have the place to yourself.